Great Lakes Carpentry is proud to have earned a Certified Green Building Professional designation through the National Association of Home Builders; we are a trade ally of Focus On Energy New Homes Program. Our homes meet stringent requirements for certification through these programs. Your home will be comfortable, safe, durable and energy-efficient–and it will be built with the environment in mind. At Great Lakes Carpentry, we work hard to minimize the environmental impact of your new home or remodeling project. 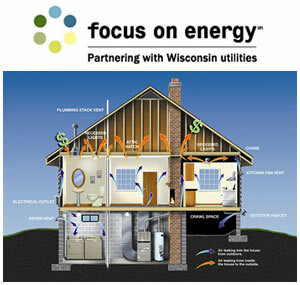 We enroll our new homes in the Focus on Energy New Homes Program and work with independent, third-party, home performance professionals to provide testing services. We collaborate in the design phase to ensure successful outcomes. Homes built to the National Green Building Standard must undergo rigorous inspection that takes building orientation, landscaping, storm water management, air-sealing, insulation, indoor-air quality, glazing, lighting and mechanical systems into account. We provide you with test results that verify the quality of our work and the efficiency of your home.